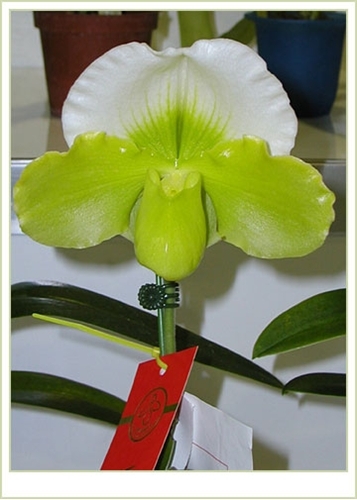 .About as green as you can get, this complex Paphiopedilum is beautifully accented with an impressively broad white dorsal sepal, accented centrally with chartreuse green venation, and creating the perfect backdrop for its chartreuse green petals and pouch! Heavy substance, waxy long-lasting large flowers are produced reliably to complement the holiday season. Highly Recommended !